You may be one step closer to having a soundtrack for your life. A new pair of fitness apps, Spring and RockMyRun, are taking highly tailored playlists to an even more specific level. Both apps select and sync the music that’s playing based on the tempo of your activity. Though both Spring and RockMyRun have their pros and cons, each app offers a new and exciting form of motivation on the treadmill or the pavement, taking advantage of processors inside your smartphone that can track your movement and choose music for you based on the exercise you’re doing. The first, a new app for iPhone called Spring graduated from its beta phase on Wednesday. It adjusts what you’re listening to based on the type of exercise you’re doing: walking, running, interval training, biking, rowing, swimming, and an umbrella term for other exhausting activities: “other.” Before you start moving, you’re asked to give the app a little bit of background on your musical tastes based on genre and artist. It sources these from a list of 10,000 songs that Spring handpicked. Once you’ve set those preferences, you’ll need to tap the pulsing orange circle in the center of the app, and your list of activity options will appear. Whatever you choose, Spring will ask whether you’ll be inside or outside. If you’re outdoors, it’ll enable GPS to track both your route and the distance you traveled. If you’re indoors, it won’t waste bandwidth on that. These tests are not as technologically advanced as I’d hoped. For running and walking, you must tap your screen every time you take a step. For cycling, rowing, and swimming, a “hands-free” test asks you to count your cycles and strokes while it times you for 30 seconds, and then manually enter them. When you’ve set your rhythm, you can press go and start your workout. This is when Spring morphs into a very simple screen with big buttons — which I found to be its most helpful feature. At any time, you can tap the gargantuan pause Pause or Skip buttons. (Keep in mind that like Pandora, you can only skip through six songs per hour). A smaller “beats per step” button sits below that, displaying your current speed. If you tap it, you can quickly adjust the tempo by sliding your finger back and forth. In practice, this is a little harder than it sounds, especially if you don’t have the best hand-eye coordination while your legs are flailing beneath you. My finger often landed on a number hard enough to simply select it when I meant to swipe. It took me a few tries to get the action down. When you do change your steps per minute, the current song you’re listening to plays for a few seconds more and then gracefully fades into the next. Of course, it’d be much more convenient if the app could automatically recognize that you’ve upped your pace. That’s where RockMyRun comes in. The already-established iOS and Google Play app has a much gaudier design, and a less graceful way of doling out music you’re guaranteed to like. Plus, you have to download specialized DJ mixes from the app, rather than reach into your own treasured music library. 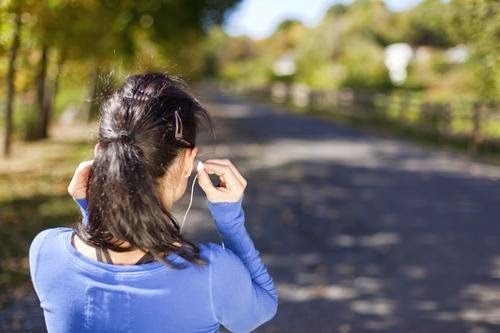 But its technology is sound: Through a feature called myBeat, it can analyze your running patterns and adjust the tempo of whatever you’re listening to in real time. It’s important to note, however, that this technology comes with a few caveats. First off, it’s available only to the app’s premium users, who must pay $4.99 a month. Second, your choice of music is arranged in premade mixes. Though you can still specify what you want by genre, artist, or DJ, these mixes are less cut and dry than the Spring app, and therefore give off an undeniably clubby vibe. Not only that, but in order to enable the real-time myBeat feature, you actually have to download the mix in question. This requires you to be connected to WiFi and wait a few minutes. In other words: You must prepare. And no matter how undeniably awesome the end result is, that kind of planning takes a bit of magic out of the whole thing. Ultimately, I found that Spring’s easy-to-navigate design and the ability to skip to a new song provided a better experience than RockMyRun’s costly, time-consuming service — even if it is more technologically advanced. But the way apps are integrating with Apple’s movement-tracking guts, it’s only a matter of time before other music-streaming services will come out with real-time tempo-changing music in a bigger, better, and, perhaps, more motivational way. 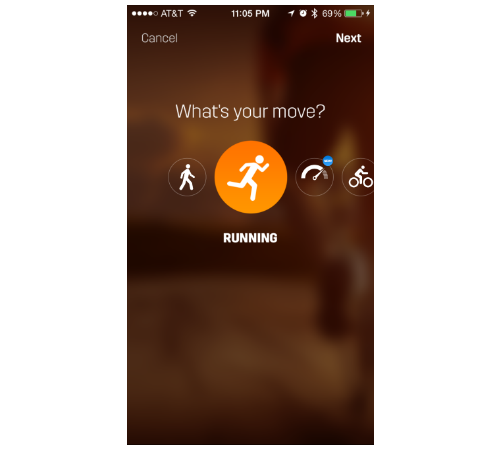 Here’s where you can download Spring Moves for iOS, and RockMyRun on iOS and Google Play.